Rated 5 out of 5 by tutortime from Loved it, worth the money. Not sure why folks are mixed on this game. Its a very long game - so maybe that's it. I look at it like - I really got my money's worth. Graphics, mini games and story line all good. The CC edition was worth the money as I used it to find the remaining few crowns that were really hard to find. Rated 5 out of 5 by smilingsun72 from Awesome game for this series! Another great story! Five Stars! After reading the comments about low ratings I had give to a review after playing all the way through. I can say that I was far from disappointed. Like Dream of Ruins (the first game in this series), I found the story captivating, the graphics and music great. Also, the puzzles were a bit challenging(in casual mode), which I liked. I loved the use of the ruby ring to dispense the magic of the crystals. Finding the hidden crowns was an extra. The developers of this series has given their audiences two great but separate stories. (They do tie the two stories together in Ruby Ring by the peddler mentioning she's off to (Aerius), which is a kingdom in the first game). Some mentioned that the game was 'short'. I never noticed this because I was engrossed in the story and kept busy by exploring to find objects, and completing puzzles. I highly recommend this game to all who want a bit of challenge and great story! Rated 5 out of 5 by LadyHawkMT from Awesome game! This game had Colorful scenes, a different sort of story line, and challenging yet fun HOS's and mini games. I appreciated how the story was revealed as you moved through the game. Great game to play. Rated 5 out of 5 by nuttytoad from Excellent Game! I too am confused by the lower ratings. I really liked this game and the prequel. I thought the graphics were excellent, the story line was interesting and the puzzles quite challenging I honestly highly recommend this game. Rated 5 out of 5 by pennmom36 from Veritas Nos Defendit....There's A Truth To Defend When the King and Queen of Minah were attacked by a strange shadow, Naya took the young Prince Tristan to safety. It has been 18 years since the King and Queen disappeared, Prince Tristan must now return to claim his rightful position as the King of Minah. When Naya and Tristan arrive at the kingdom, they are faced with many complications, unrightful heirs, lies and deceit. The irony of everything becomes painfully clear with the discovery of a statue dedicated to his parents, and a plaque that reads "Veritas Nos Defendit" truth to defend! I know, I know, another fairy tale about a King and Queen whose baby was whisked away by the nanny, and returns to face an evil ruler. The storyline is definitely the same ole same ole, but I really enjoyed playing this game, the graphics are decent, the games are entertaining, and I thought the 60 Collectible Crowns had just the right amount of challenge to find them. There are Plus Sign inventory items which require interaction with before using them, and there are 20 different Achievements to earn. The only "helper" you have is a Ruby Ring handed down from King to King, and each time you use the ring, you get to play a different Mini Game. 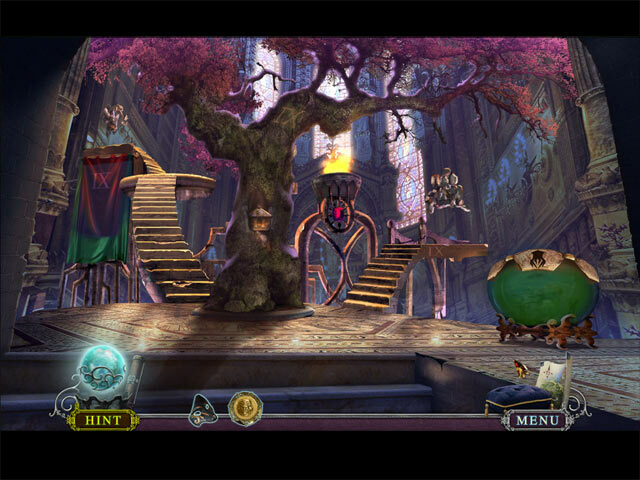 There are only a few Hidden Object Scenes available in the demo, and I was disappointed when the same scene was repeated. There are Silhouetted Shape finds where you find multiples of items that match the shapes shown, Interactive List finds, and a scene where you find items that match the words a fortune teller tells you in a story. Technically, there are some mini HOP's where you find a handful of leaves etc. 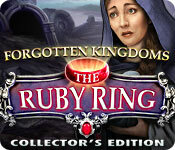 There are Mini Games associated with the Ruby Ring, each time you use the Ring, you must first complete a game, which is different each time. The object is to break the crystals, once by making matches of every symbol after getting one sneak peek, the second ring game requires you to find the correct path by choosing the symbols in the correct order as shown, and the third ring game requires you use directional arrows to smash all crystals using the crystals as bumpers. The normal Mini Games are just as entertaining, my favorite game was a Honeycomb grid that requires you to fill in all the cells without overlapping. This Collector's Edition has 4 available Wallpapers, 25 Concept Art pictures, 18 replayable Mini Games, 6 replayable Hidden Object Puzzles, 11 Music Tracks, 20 Achievements to earn, a built in Strategy Guide and a Bonus Chapter, enjoy! Rated 5 out of 5 by skullfun from Execellent Sequel to Forgotten Kingdoms: Dream of Ruin Time to restore peace and order in the Minah kingdom in Forgotten Kingdoms 2: The Ruby Ring Collector's Edition! When your hero Prince Tristan was just a baby, palace coup caused by the dark forces forced him to run away from the castle. During the coup both of his parents were killed. He was saved by his dear nanny who loved the young Prince so much that she risked her own life to save him from the shadowy figures which took away royal guards and the King himself, despite his magical powers. Nanny even had taken King’s ruby ring, which should belong to the current ruler of the Minah castle. And when Prince Tristan reaches age 18, she gives the ring to him…help Tristan to use the magical ring to restore his rights and become a king in this current installment. The story line in this edition isn't relative to the first game. I really enjoy this series, it requires brain power and should appeal to intermediate/advanced players. Beautiful graphics and voices. HO's that require inventory items to complete and challenging puzzles. This Collectors Edition has Wallpapers, Music, Hidden Object games, an Art Gallery, Puzzles, Achievements, Hidden Crowns, a Bonus Chapter and of course a built in Strategy Guide which I highly recommend with this game, enjoy! Rated 4 out of 5 by krystal59 from pretty good but not great I did like this one. I liked the collectible crowns that were really a challenge to find! Thank goodness I left the map so it would show a crown icon if there were more to collect in a given location. This prompted me to return and search more than once. There were sixty to collect in total. Decent storyline about a ruby ring that determines who will be King and how one false one was created with a demon entity attached. There were some varied and sometimes challenging HO scenes and some really fun puzzles. A few achievements to strive for in this one also. Nothing unusual, just the basics... do 5 HO's without using a hint etc. For me.. I did find the storyline in the bonus chapter a bit sappy. The villain becomes the hero.. but whatever. It was still pretty good with a reasonable length to both the main chapter and the bonus chapter. Be prepared for a fair bit of back and forth in this one also. But overall it was a nice game that held some challenge which I really like and we don't see all the time. So well done. Good solid game with pretty scenes and good use of color that was fun to play. Rated 4 out of 5 by Verbena84 from Wonderfully great! 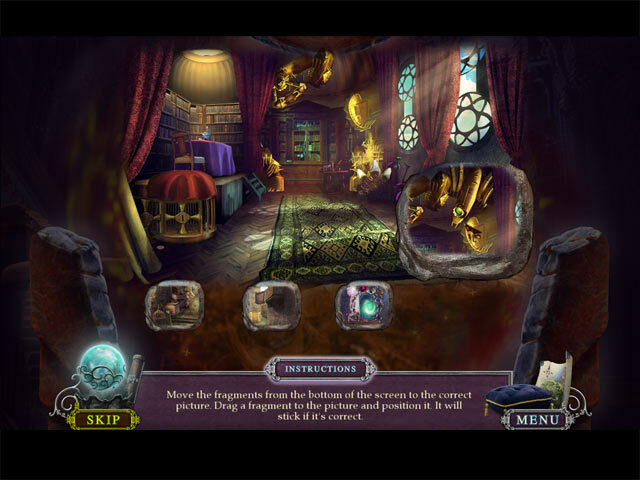 Mystery and hidden object games have always been my favorite and when I get to play one that keeps my interest that is even more rewarding. Rated 4 out of 5 by kateblue222 from Too many random guessing games, but still fun, and excellent music. I am probably halfway through this game. 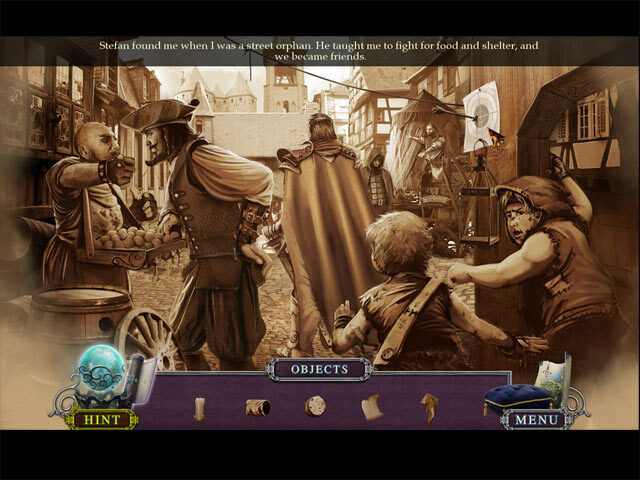 The game starts out with Tristan, who upon turning 18, finds out that he is a prince. He has been hidden since he was a baby. Now he must return to free his kingdom (from invading purple crystals, apparently). To help him, he has a ruby ring that attacks the crystals. The problem here was lack of clarity in instructions/lack of logic in actions to be taken. Make sure you start out with a piece of paper. You will need to write things down, like the order of buttons to push in order to progress. (I haven’t done this so much since Myst!) You need a pencil even when you are not playing an actual “mini game” but are just trying to complete an action or get an object in order to progress. I actually went to the guide three times, very unusual for me. Despite relying on the guide, I found the mini games were entertaining, at least for a one-time gaming experience. Many of them were kind of like playing “Concentration." I had already bought the CE in a recent sale, and I always like the feature that allows you to play mini games over. But the jury is still out about whether I will find any of the mini games so interesting that I WANT to play them over. SKIP REST OF PARAGRAPH TO AVOID SPOILER. For example, I had no hope of solving the "gears” puzzle, which caused one of my trips to the guide. You had to move gears into a specified pattern in 7 moves. The guide showed you could move a gear across two other gears instead of just moving into the next spot. But these puzzles usually require that you move only to the next spot, so I don’t think it’s a poor assumption on my part. Bad game instructions, IMHO. (Also, this was another place where I needed a piece of paper to write down the solution.) HOs were ok. Nothing special. I’m more fond of the other parts of these games anyway. There’s one stupid annoyance that actually made me laugh. (It's kind of typical of the game, so I tell you about it to give you more of a feel for the game.) In one scene, there’s this woman who has been set out to meet Tristan and has been waiting around for him for 18 years. If you click on her, she says, over and over, “Do you sense anything unusual? There is something hidden here, something important. Look closely.” DUH! Isn't that the whole point with these games? Not really much of a clue, is it? The graphics were inconsistent. Sometimes clear and beautiful, sometimes cluttered and forgettable. The hint button was strange. For one thing, sometimes it would just sit there and not take you out of a scene. It would just repeat the same written clue instead. For another thing, when a hint was taking you to a different place on the screen, the hint’s indicator, a swirling white circle of stars, did not cut off quickly enough. So when it points you down a road to the next scene with the white circle of stars, the circle doesn’t disappear once you have moved into the new scene. Instead, the circle continues to swirl around in the same location where it was in the previous scene. At first, this led me to believe that I was supposed to click on that spot in the new scene. But that’s not true. This is not a glitch, but is apparently what the developers meant to do. Annoying. But the music is excellent, which I don’t often say. Being a musician of sorts means that oftentimes music bugs me, so I have to turn it off. Not this time. The main theme, which is #6 of the downloads, named (not surprisingly), "Forgotten Kingdoms," is great. It kind of reminds me of The Game of Thrones theme music. I’m listening to it in iTunes right now. The little flute accents make me smile. Hat’s off to Mr. David Mesiha, who shows up as the composer when you load the songs into iTunes. So anyway, this game is not an immersive experience that will keep you up past your bedtime, but it is relatively fun. Try it. You might find it mildly entertaining.